How Long will the Greek Bank Crisis Last? The Greek Crisis precipitated a political firestorm in the country, with 39 members of the far left Syriza Party rejecting the European bailout conditions in the Greek parliament. That Prime Minister Alexis Tsipras was able to muster support for the passage of a third bailout from the troika (European Commission, European Central Bank and the International Monetary Fund) and the European Stability Mechanism is testament to the urgency and importance of outside assistance. The current Debt/GDP ratio is hovering around 177% (Wall Street Journal 3 July, 2015). Even if allowance is made for full compliance and implementation of the T&C imposed by the troika and the ESM, Debt/GDP would still remain high at 142%. Viewed in perspective, these numbers simply extrapolate the severity of the crisis that lingers in Greece. The banking sector has been particularly hard hit, with cash-strapped banks unable to operate freely. Customers have been limited to withdrawals of €60 daily, and even with the reopening of banks and the Athens Stock Exchange on Monday 3 August, these restrictions remain in place. Customers are capped at €420 in weekly withdrawals from banks. The cash crisis in Greece was so severe that a shortage of €20 notes effectively limited withdrawals to €50 daily. When the ASE opened, markets plunged at the opening bell. The bears are out in full force, dominating the eviscerated Greek banking sector where equities were savaged. Banking shares were suspended when the 30% volatility figure was hit. The Banking Index includes major Greek banks in Eurobank, Piraeus Bank, Attica Bank and others. The Bank Index has plummeted in recent months as it has accounted for half of June trading activity. Are European Traders at Risk with the Greek Banking Sector? Outside of Greece, it appears that very little impact has befallen international investors. This reality is born from the fact that traders and investors have had sufficient advance warning about the perils of being invested too heavily in Greece. Since Grexit talks began, massive capital flight has been taking place from Greece. This has left the burden on domestic investors and traders, while foreign investors have been able to escape largely unscathed. 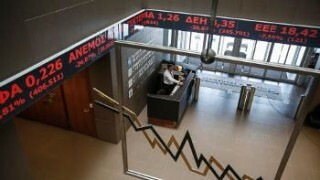 However, while the Athens Stock Exchange was shuttered, other bourses were open and investors were able to adjust their holdings accordingly. The net result is that while losses on Monday 3 August were substantial and alarming, the spillover effect into other European, Asian and American bourses was limited. After its first day of trading, the ASE closed 16.23% lower, after dropping as much as 23% by the mid-afternoon. As funds exit Greek equities, they are finding their way into European markets. Generally, European manufacturing companies have been performing better and they are now receiving funds shifted from Greek companies. That the entire Greek stock exchange plunged over 20% in a single day of trading is unprecedented, and it makes China’s 8.5% decline appear insignificant. However one should not lose sight of the market capitalization element. The total value of Greek companies (243 of them) on the Athens Stock Exchange totals some €43 billion. This makes the Greek bourse one of the smallest in Europe, and in the world of finance and investments – size matters. The Greek exchange is smaller than Vienna and Luxembourg, but it remains a harbinger of sentiment for the preservation of Eurozone unity and stability. As the August 20 deadline approaches, investors will be eager to see whether Greece can make good on its debt repayment to the ECB. Already the EUR/USD currency pair is trading at multi-year lows, and interest-rate hikes in the US later in 2015 will likely spur a further rise on U.S. Dollar Index. What are Capital Controls and how do they work? Why has Greece delayed today’s IMF payment? What Is The Euro Crisis? A simple explanation!